cephalon into the cerebrum and the basal ganglia, which are involved in control of movement. As will be seen below, the thalamus is central to lower processing and relay of signals from sensory organs to higher centers of the cerebrum, where they are further processed and integrated. Figure 15-5A indicates some of the genes whose regional expression is correlated with these morphological areas. Overall dorsoventral differentiation is established or affected by mutually inhibitory interactions between dorsal Bmp4 and ventral Foxgl (also called BF1), whereas the cortical LGE-MGE distinction reflects mutual inhibitory interactions between genes activated via Nkx2.1 and Pax6; Dlx, Msh, Gsh, and Lhx gene expression also differentiates these regions. These expression patterns also reflect and are markers for the histological, and cytological differentiation of the region, and are generally conserved among vertebrates that have been tested (e.g., see Monuki et al. 2001; Puelles et al. 1999; Redies and Puelles 2001). The regional expression pattern is also consistent with known signal-transduction interactions, in that the interacting genes are expressed in the same region. Although these expression patterns still mainly serve as regional markers, over-and under-expression studies have confirmed their general functional importance and relevance, and some of the temporal and regulatory hierarchies are being identified (Schuurmans and Guillemot 2002). Further, their importance in indicating the orderly and segmental, hierarchical nature of brain development is that it makes the evolutionary origin and development of an organ of this complex nature easier to understand. As the size and complexity of vertebrates increased, the cerebrum began to dominate the forebrain. The cerebrum is filled with neurons and is where complex processing of sensory information (for example, auditory, visual, olfactory), the intentional planning and initiation of movement, and many forms of learning, among other activities, take place. The cerebral cortex is the 1- to 4-mm outer layer of the cerebrum and formed of three subdivisions, sometimes called the neocortex (the new cortex, unique to mammals), the paleocortex (old cortex), and the archicor-tex. (These names are intended to reflect the phylogenetic origins of the regions, but may not in fact do so, as there is not a clear consensus about the origins of the neo-cortex (Northcutt and Kaas 1995)).The paleocortex is basically the olfactory region of the brain and receives direct input from olfactory neurons, as specified in Chapter 13. The archicortex is primarily the hippocampus, or memory area, an inner fold of the temporal lobe. These regions differ cytoarchitecturally—the archicortex is a single cell layer, the paleocortex is two layers of cells, and the neocortex is formed of six layers, described below. Several ideas regarding the origins of the neocortex have been proposed. It may be an enlargement of the reptilian dorsal pallium (roof, literally "cloak" or outermost layer) or the migration of two sources of cells from lower parts of the neu-raxis (see Karten 1997 and Northcutt and Kaas 1995 for discussion of primitive mammalian cortexes). Since the evolved function is what counts, this might be largely an academic question. But it could turn out to have implications if, for example, there are as yet unknown vestiges of the original functions that may constrain the current ones in some way, be related to particular diseases, and so on. Searches for expression of cortex-specific gene combinations across the spectrum of living vertebrates will undoubtedly provide many clues about how this evolution occurred. Full documentation of the patterning processes will help. The neocortex comprises about 95 percent of the cerebral cortex and is somewhat arbitrarily subdivided into four or five major regions (Buxhoeveden and Casanova 2002): the frontal, parietal, temporal and occipital lobes and sometimes including the limbic system (Figure 15-6). 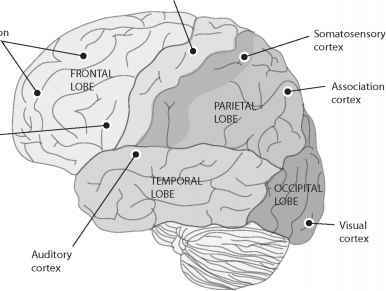 Although sensory processing is integrated throughout the brain, each of these lobes has specialized functions. The frontal lobes are involved in emotion, thinking, planning, personality, language, and sexual and social behavior, among other functions. Of course, some of these functions—as we humans choose to label them—are specific to humans (e.g., language, planning), and some (e.g., pheromone responses) to nonhuman (including some Old World monkeys and apes) vertebrates. But we must again guard against unwarranted anthropocentrism. Squirrels plan for the distant future when they bury nuts in the summertime; can we say they do not know why, nor envision a remembered meal on a snow-covered branch? The cortical lobes are not symmetric, and, as a general rule, the human left side predominates in control of language, whereas the right lobe controls nonverbal activities. This is by no means invariant, nor is it clear how these separate functions are established genetically, although some of the molecular mechanisms are beginning to be elucidated (Essner et al. 2000; Morgan et al. 2002). The parietal lobe is involved in mechanosensory perception; touch, temperature, pain, pressure, as well as taste. It also helps integrate visual input. 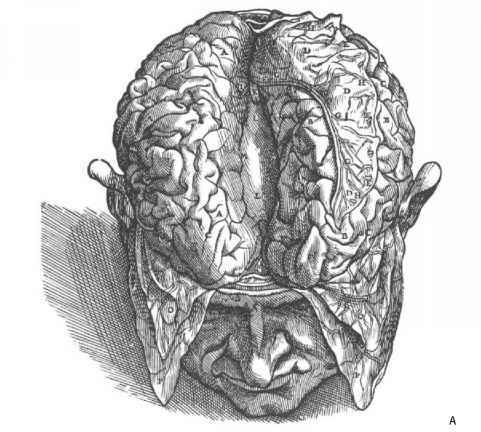 The temporal lobe is involved in auditory perception and integration, memory, and language abilities, among other functions such as the sense of "self" and "other," generally on the left and rights sides, respectively (this perceptual self-nonself distinction is not to be confused with a circulating, molecular, immunologically based distinction).The occipital lobe is responsible for some aspects of the processing and interpretation of visual input. The limbic system controls aspects of the autonomic and endocrine systems, including feeding behavior, homeostasis, and emotion. Figure 15-6. Lobes of the adult cerebral cortex and major sensory areas. The external surface of the forebrain is characterized by species-specific patterns of fissures, sulci (grooves), and gyri (ridges) of tissue. The human brain is densely covered with such fissures. The degree of fissuring varies among species, however, with some like rodents having little such structure and primates much more. The deepest sulci reflect the early, major, primary division of the forebrain into its various lobes, which are not only phylogenetically conserved but reflect the kind of basic segmenting developmental processes we have discussed. However, the meaning of the rest of the fissuring is less clear, but is interesting from developmental, evolutionary, and functional points of view. Genetic evidence is currently weak and mainly suggests that overall pattern, size, and shape (plus the major fissural structures) are genetically influenced, at least to some general extent. Figure 15-7. Brain surface patterns in humans. (A) Vesalius' drawing in 1543. 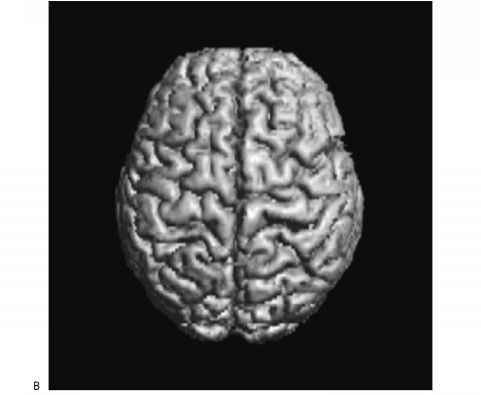 (B) sulcal patterns vary even between left and right sides of the same brain. (A) Vesalius reprints are from (Vesalius 1543); (B) MRI data from Pearlson and Bata compiled into a figure by K. Aldridge and reprinted with her kind permission. of this is purely random (and we don't understand the processes responsible). How much of the pattern is genetic, in what way it is genetic (specific sulci? the overall complexity of sulci? ), and what functions are associated? For example, to what extent does the asymmetry reflect—or determine—the existence of hemispheric dominance, handedness, and so forth (Weiss and Aldridge 2003)? These questions are not easy to answer but could be important to our understanding of brain evolution, particularly of the "higher" primates whose brains are particularly characterized by such patterns. If the fissure pattern has a large chance component, and if this affects function because, say, of the relative amount of cortex available for some particular function like literary or athletic ability—or Einstein's unique physics ability—then evolution might be viewed as providing that randomness as a kind of generator of variation, much as we see in our immune system. Alternatively, the details of fissure patterning could have no particular meaning. It is a very difficult question to answer, or even to state how to answer it. The cortex is internally organized in a segmental way. The prevailing view is that the basic structure is columnar, with each column (or "minicolumn") being a fundamental functional processing unit about 50 mm wide and containing 80-100 neurons. All neurons within a column may serve the same sensory modality, although this is not a universally accepted interpretation (Nieuwenhuys et al. 1998). The human cortex has six basic transverse cellular layers, each with distinct neuronal organization. The number of layers in the cortex differs among vertebrates, and the primordial number was probably two or three, as evinced by the number in contemporary lower vertebrates as well as in the evolutionarily earlier sections of the mammalian brain. Some of the layers contain neurons that project to subcortical structures; others contain neurons that extend only locally within the column. Groups of 60-80 minicolumns are, in turn, bound together by short neuronal connections into "macrocolumns," (Buxhoeveden and Casanova 2002).The laminar and columnar organization of nonmammalian brains is less visibly obvious, however. Columns are essentially the same size in most brains; apparently, the cortex expanded in size over evolutionary time with increases in column number, not column width or basic structure. The six radial layers that form the primate neocortex are depicted in Figure 158. The cellular composition of the layers differs somewhat even among mammals (Northcutt and Kaas 1995), but, in primates, layer I is acellular, primarily an area in which incoming axons form synapses with dendrites from neurons from deeper layers. Layers II and III contain numerous pyramidally shaped neurons, pyramid cells, and these cells make synapses with many of the incoming axons from layer I. Layer IV contains star-shaped stellate cells, which have axons that remain local and receive input from axons carrying sensory signals from other regions of the cortex. Layer V is full of pyramidal cells with the largest cell bodies in the cortex.The axons from these neurons extend long distances, to the brain stem and spinal cord. Axons from pyramidal cells in layer VI extend to noncortical regions of the CNS, including the thalamus. The cortex is thus a complex structure highly differentiated at the cell level and much more "refined" than the general regional segmentation reflected in the expression patterns described above. The ventricular zone is the source of differentiation of a variety of neurons and their associated glial (supporting) cells. In cortical development in mammals, neurons arise some distance away from their eventual destination. Neurons that will migrate to the cerebral cortex are formed early in gestation deep within the brain, in the ventricular zone. The VZ is developmentally transient; neurons form in this region, and when cells in the VZ stop dividing, neurons generally no longer proliferate. In the forebrain, neurons migrate outward along transverse ("radial," inside-out, or ventricular-pallial) glial supporting cells, perhaps the way ivy climbs a trellis, though relying more on molecular than physical motive force, to form first a pre-plate above the ventricular zone. The next set of cells to migrate form a subplate, and these separate to form a region called the cortical plate. The outer layer of cells is then known as the marginal zone, and this differentiates into Cajal-Retzius cells. Neurons migrate into the cortical plate where they begin to differentiate, some becoming excitatory neurotransmitters, for example, and others inhibitory (the two provide a balance to activate and inactivate signal transmission at a given juncture, policing the neurotransmitter's ion channel states). Neurons migrate along radial glial cells as guides. They enter the cortical plate and keep moving past other cells until they reach the Cajal-Retzius cells. Each new generation ends up passing previous generations to come to rest on the then-outermost layer. In this way, all six layers form, with layer VI deeper but forming earlier than layer II. Figure 15-8. 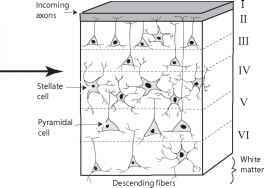 Cellular layers of the adult cortex; pyramidal and stellate cells, the principal neuronal cells of the cerebral cortex. 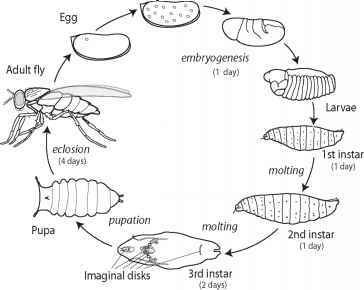 Some of these aspects can change over evolutionary time, perhaps by phenotypic substitution in which essentially the same functional result is achieved in develop-mentally different ways, even in related animals. In reptiles, the cortex develops in the opposite direction, from the outside in (Butler and Hodos 1996). The dorsal cortex is considered by some to be a homolog of the mammalian neocortex, and, unlike the neocortex, the dorsal cortex develops in such a way that the cells that form later are located below the earlier cells. In an adult mammalian cortex, the cells on each layer share characteristic properties, such as the extent of axonal projection beyond or beneath the cortical column they form. But cellular identity seems to be plastic at least in part, determined by environmental cues, not genetic programming at first mitosis. Transplant experiments have shown that the cell's laminar position, when it undergoes its final differentiation, determines its fate. Arealization, however, does seem to be genetically programmed by mechanisms that maintain architecture or segmental boundaries, although neurons can also be redifferentiated to a new functional context. The minicolumns of the cortex are homogeneous in appearance, despite the diversity of the information they process. This is in contrast with the specialized neurons in the different areas of the subcortical regions, which have an appearance specific to their task. The staged development of the mammalian cortex, with the cells that proliferate first forming the deepest cortical layer, and subsequent generations layering above them to form the layers closest to the surface, is called the "radial unit hypothesis" because it is believed to explain the development of the columnar organization of the cortex; related neurons develop by layering on each other and subsequently developing synaptic connections among themselves and in neighboring columns, to form the specialized regions of the cortex (Mount-castle 1978; Rakic 1988; Rakic and Lombroso 1998). Again, the functional significance of the columnar organization of the cortex has still not been substantiated, and, in fact, it is still not completely accepted that the entire mammalian neocortex indeed is structurally columnar (Nieuwenhuys, Donkelaar et al. 1998). The molecular and genetic basis of these migrating pathways is beginning to be understood (Gupta et al. 2002; Hatten 2002; Lambert de Rouvroit and Goffinet 2001; Marin and Rubenstein 2002; Rice and Curran 2001). Much of the knowledge derives originally from naturally occurring human or mouse diseases, which led to the discovery of the genes involved. Here, we present a simplified account of what is currently understood. The Cajal-Retzius cells are a source of the Reln (or Reelin) gene product. A TF called Tbr1 seems to be important in the formation of Cajal-Retzius cells and hence of Reln production. This secreted Reln protein attaches to the extracellular matrix and forms a concentration gradient from the marginal zone downward. Migrating neurons express various receptors on their surface, including the VLDR and ApoER2 lipoprotein receptors. These bind to Reln, triggering an intracellular messenger cascade that involves various factors (e.g., Dab1, Cdk5, Cdk5r) that, in ways not yet fully understood, may cause the neuron to lose cell adhesion cell-surface properties required to stay attached to guide glial cells. In any case, the neurons appear to drop off the glia at this point— right under the Cajal-Retzius layer that produced the Reln gradient to come to rest. Radial migration retains the relative spatial location between the precursor cells in the VZ and their corresponding cells in the cortex; therefore, the cells involved have been called projection neurons. By contrast, other neurons migrate tangentially (laterally to the columns) and travel considerable distance within a layer to become interneurons and are thought to be involved in local circuitry integration (Anderson et al. 2001; Marin and Rubenstein 2001; 2003; Monuki, Porter et al. 2001; Monuki and Walsh 2001). In terms of what is known, the two types of neurons arise from different precursor populations and can be distinguished in part by expression of TFs that characterize the source and destination regions (Figure 15-5B). Neurons can also be characterized by their major neurotransmitter expression, the particular ion channels, or other mechanisms used to receive or trigger the transmission of a signal impulse. The three main classes are functionally relevant as well as useful in identifying developmental lineages and aspects of brain regionalization. Their migration patterns are shown schematically in Figure 15-5B. Radially developing projection neurons generally are in the glutamatergic class, and tangentially developing interneurons are in the GABAergic class. Cholinergic neurons mainly use acetylcholine. Other neurotransmitters, such as dopamine, are used by other types of neurons. Glutamatergic neurons predominate in the cortex, but the LGE and MGE send a substantial number of GABAergic neurons into the cortex (Marin and Rubenstein 2001; 2003; Puelles, Kuwana et al. 1999) (Figure 15-5B). GABAergic neurons migrate tangentially out of the MGE and LGE (e.g., Hatten 2002; Marin and Rubenstein 2001; 2002). The mechanisms of the extensive and highly patterned neural migration are varied. Some of the migrating cells express neuropilins, which are receptors for semaphorin 3A and 3F. The latter are expressed in the striatum region (below the cortex, including the LGE), and this appears to guide or trap these interneurons for a striatal destination, whereas other cells that do not express neuorpilins migrate to the cortex. Guidance of this migration seems to be affected by extracellular matrix molecules, including gene products Slit and its ligand Robo, and Netrin and its ligand Dcc, but details are not well known. Olfactory neurons are a special class because they are continually replaced by new olfactory neurons, which originate in the subventricular zones and move to the olfactory bulb in a chain of cells ensheathed by protective, guiding glial cells. Two axon guidance repellents include EphB and EphA RTK receptors and their Ephrin ligands, and surface cell adhesion gene products are also important (see below). How Are Boundaries and Segments Maintained? The migration of neurons is but one of several cell migrations in vertebrate development (and such things occur to a lesser extent in other animal groups); NC cells are a prominent example. Cells that migrate need to find a path, to have a mechanism for following it, and to associate only with the appropriate cells in the neighborhood as they pass through. Migration involves both intracellular mechanisms and external chemotactic (attractant or repellant) clues and involves the production of signaling molecules that may diffuse or may be attached, as in the Reln mechanism for projection neuron migration. Also, the migrating cells must express the appropriate receptor. Experimentally mingled neural cells may aggregate if they are genetically similar or repel if they are different. Alternatively, introduced cells may redifferentiate to take on the expression patterns of their surrounding cells. Several cytological mechanisms are involved in boundary maintenance. Cells may bundle physically together based on identity of cell surface adhesion molecules. One family of such molecules is the Cadherins (e.g., Pasini and Wilkinson 2002). Cells that express the same set of Cadherins on their surface adhere to each other but will not adhere to cells expressing other members of the gene family. In this way, Cadherin expression "codes" can subdivide the developing brain either regionally early in development and/or functionally later on. Fiber tracts, or bundles of cells of common origin, can stay together, retaining morphological or functional coherence, while crossing through regions. For example, as indicated in Figure 15-5A, the cortex expresses Rcad, whereas the adjacent LGE expresses Cad6. That the two sets of cells are distinct is also reflected by their expression of Pax6 and Dlx1, respectively. Combinatorial Cad-herin expression codes appear to play a role in maintaining prosomere integrity from the early to the mature brain (e.g., Redies and Puelles 2001). Fiber tracts from the motor area of the cortex, or to the cortex from auditory and visual sensory organs, pass through several brain regions and must thus maintain coherence. Thus, areas in the cortex express Cad6, 8, and 11, as do the incoming sensory thalamic nuclei (see below). Once appropriately attached, neurons are physically guided by glial cells, hence keeping the right neurons going to the right place even when surrounded by other types of cells. Olfactory neurons may retain (or obtain) their specificity in terms of the olfactory receptor gene they express. This may serve as a kind of guide mechanism between the parts of brain and olfactory epithelium appropriate for that olfactory receptor gene (of course, this does not address the question of what determines spatial expression of different types of genes in the first place). Two subsets of Ephrin genes for membrane-bound tyrosine kinase receptors and their ligands, designated EphA and B, appear to be involved. Class specificity appears to be involved in axon guidance by separating A-expressing from B-expressing cells. Ephrin expression differences help separate the hindbrain into odd- and even-numbered rhombomeres. Other cell adhesion molecules like Integrins and diffusible gradients (Netrins, Slit, and others) also help guide axon migration (Redies and Puelles 2001). The familiar Notch receptors, their ligands Delta and Serrate, and the modifying gene Fringe play compartmentalizing roles in Drosophila patterning, and the homologous mechanism appears to be involved in vertebrate neural development. Fringe modifies Notch receptor structure, suppressing its activation by Serrate, and together these genes can establish patterns of affinity or repulsion. The same system seems to be involved in the specification of certain neuronal precursor cells in the VZ to differentiate into neurons, while surrounded by inhibition zones of nonde-veloping cells. Notch-related patterning mechanisms also appear to be involved in thalamus development and in dendrite morphology in cortical neurons and perhaps gliogenesis. 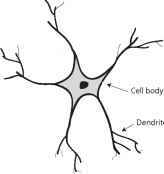 Neurons can also be reprogrammed when they contact differently programmed neurons. Reprogramming of intermingling neurons by their local context has been shown experimentally in the hindbrain (Pasini and Wilkinson 2002). As noted earlier, the isthmus separates anterior and posterior cell types, which we can identify by their morphology and expression of indicator genes Fgf8 posteriorly and Wnt1 anteriorly. Transplanted cells become reprogrammed to express indicator genes appropriate to their new context. The initial boundaries are sometimes "fuzzy" but subsequently sharpen. A model suggested by Pasini and Wilkinson is that cells respond to quantitative gradient thresholds of SF molecules like Fgf8. This is not a precise mechanism, but response to SF levels exceeding the threshold induces appropriate Hox and associated Krox20 and Kr expression. In turn, this induces Ephrin, which, being a qualitative cell-binding system, sharpens boundaries between cell types. Consistent with these ideas is that inactivation of genes mentioned in this chapter often has quantitative rather than clear, simple, or qualitative effects. Not only must a cell have a path, it has to have a means for moving along it, and there are several (Gupta, Tsai et al. 2002). In one, the cell creeps along following a projection that detects extracellular signals or works its way along a glial guide cell. In another, the cell sends out a filamental projection (filopodium) toward a guiding signal, which fills with cytoskeletal tubules. The nucleus and rest of the cell are then pulled into the projection, and the process begins anew. Appropriately, cytoskeletal and adhesion genes (Lis1, Dcx, Filamin1, Cdk5, and Astn1, Integrin3, respectively) have been found to be mutant in natural disorders of cortical layering (or the latter produced by experimental mutation in these genes (Gupta, Tsai et al. 2002; Hatten 2002; Marin and Rubenstein 2002). We can relate these various developmental process notions to the way that the neo-cortex becomes functionally organized, peri- or postnatally depending on the species, into areas of the brain specific to different sensory inputs, such as optical, auditory, or olfactory areas. The thalamus is a relay center for most incoming sensory signals as we will see in Chapter 16 in regard to particular sensory systems. At present, it is not readily apparent whether the role of thalamocortical axons (TCAs) in arealization is molecular or due to external cues like sensory input relayed to the brain, and there has been longstanding debate about this issue. The protomap hypothesis suggests that the arealization is controlled intrinsically, when the neurons are generated (Rakic 1988). This would imply a kind of prepat-terning in the brain, which would not be without precedent in vertebrate development, as we have seen. The alternative protocortex hypothesis suggests that arealization instead takes place when the neurons are in place and receiving incoming sensory signal (O'Leary 1989). For example, "rewiring" experiments in which afferents are redirected into areas to which they do not normally project—for example, optic afferents sent to the olfactory area—result in functional remapping of the reassigned cortical area (e.g., Scalia et al. 1995), suggest that the arealization of the cortex is driven by experience rather than by preprogramming. This view would be consistent with the brain as a flexible instrument of organismal survival rather than a form of response automaton. It would also be consistent with examples we have seen, including in neurally relevant situations, such as epithelial-mesenchymal interaction involving migrating NC cells. Both kinds of patterning are probably important and act separately and syner-gistically, at different developmental stages (e.g., O'Leary and Nakagawa 2002; Sur and Leamey 2001). There are ample mechanisms available in the developmental repertoire. Before their differentiation, prenatally, differential expression of a number of familiar gene families and pathways is seen in numerous neocor-tical regions, as discussed above. The areas are then differentiated cytoarchitec-turally and chemoarchitecturally, as well as by their distinct efferent and afferent pathways. The borders between many functional areas in adults are distinct, and easily discernible, but the borders of these regions of gene expression during development are not. The borders subsequently become distinct at about the time that TCAs have extended to cortical layer IV, around the time of birth. The temporal patterning, coupled with many negative results of searches for genes confined to functional cortical areas before thalamic innervation, suggests that perhaps prenatal regionaliza-tion is genetically controlled but that arealization is controlled by thalamic inputs (Pallas 2001).